I know how much the reading obsessed love to check out the book towers of others, so click on the photo to avoid eye strain. Please notice how carefully I stacked them to prevent Pisa Syndrome. This photo also answers the question I posed last week in Which Stack Is Mine? For the true sleuth, there were clues. One stack contained a book (Inger Ash Wolfe's The Calling) that I'd already read and reviewed. Plus... 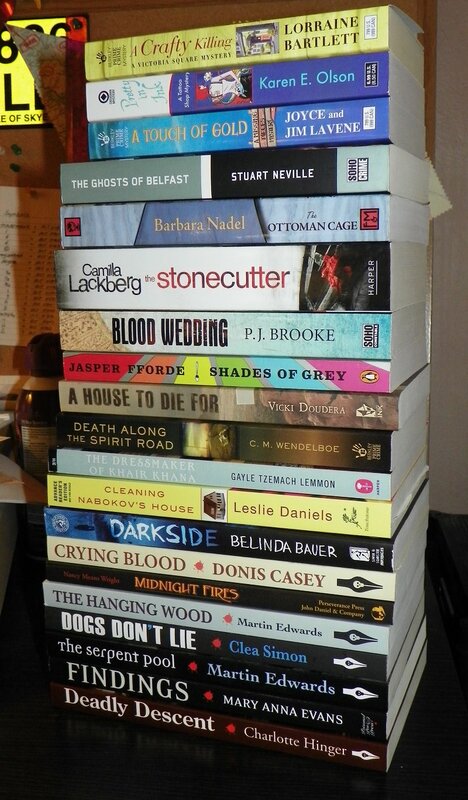 I'd also mentioned several of the books in my stack in my New Mystery Releases posts as ones that I'd added to my wish list. Now they're off my wish list and included in my LibraryThing inventory. So... are you a good sleuth??? I know that those who answered correctly are in the running for a prize from Kay on My Random Acts of Reading! Kay has drawn the name of the lucky winner. Congratulations, Nise'! So, my stack was on the left in the picture and yours was on the right. And, yes, I'll be picking a winner from the correct guess bunch for a bit of prize pack. There were several right answers. Post will go up sometime this afternoon. Well, it looks like I guessed wrong. I'm glad to see you're doing your patriotic duty supporting publishers, authors and indie bookstores! One of the things that made me think that was your stack was the Barbara Nadel book, since you'd recently reviewed Belshazzar's Daughter. And a few days after the picture went up, Dog's Don't Lie showed up in your current reads on the side of your blog, which seemed to confirm it. This is why I limit my visits to bookstores, too. Kathy-- You bet I am! Pepper-- You are the Superior Sleuth! Either that, or I'm just real quick to make guesses on minimal information, lol! Love the stack..looks like a lot of great reading in your future.